Dating as far back as the sixteenth century, this classic British dessert has seen its popularity ebb and flow. A Fruit Fool is a delicious mixture of lightly sweetened fruit that has been pureed and then haphazardly folded into whipped cream. I like to use tart fruits such as raspberries, gooseberries, blackberries, kiwi, loganberries, and rhubarb to make Fruit Fools, as they pair so beautifully with the sweet cream. A Fruit Food is aptly named, since the word "Fool" is believed to have originated from the French word "fouler" which means "to mash" or "to press". And this is exactly what we do with the fruit to make this dessert. A Fruit Fool begins with making a puree from either fresh or frozen fruit. For the kiwi fruit fool, I used fresh kiwi fruit. For the blackberry, raspberry, and strawberry fruit fools, I used frozen unsweetened berries. I like to make the puree the day before it is needed so it has time to thicken and the flavors to blend. Although best when make shortly before serving, you can make the fruit fools several hours in advance of serving. It is best showcased when served in a long stemmed parfait or wine glass, garnished with fresh fruit. A cookie is also a nice accompaniment. There are a few things to keep in mind when making fruit fools. Anytime you use fresh fruit there is no way to know, without tasting, the exact amount of sugar needed. So tasting is very important here. Make sure you taste the puree and adjust the sugar as needed. The same is true when you mix the puree with the whipped cream. Taste and adjust the sugar and amount of puree as you might want to add a little extra puree if a stronger fruit flavor is desired. Strawberry Fruit Fool: For the puree: Thaw the berries, place in a food processor, and process until pureed. Transfer to a bowl and stir in the sugar (add more if needed). Place in fridge for several hours. Place mixing bowl and whisk in the freezer for about 15 minutes. Whip the cream and sugar until stiff peaks form. With a rubber spatula gently fold in the strawberry puree, leaving some streaks of the cream. Pour into glasses. Cover and refrigerate until serving time (up to 4 hours). Kiwi Fruit Fool: For the puree: Peel and cut the kiwis into quarters. Place in a food processor and process until you have a rough puree. Transfer to a bowl and stir in the sugar (add more if needed). Refrigerate for several hours. Then place mixing bowl and whisk in the freezer for about 15 minutes. Whip the cream and sugar until stiff peaks form. With a rubber spatula gently fold in the kiwi puree, leaving some streaks of the cream. Pour into glasses. Cover and refrigerate until serving time (up to 4 hours). Blackberry Fruit Fool: For the puree: In a strainer placed over a large bowl thaw the blackberries and then press to remove all the juices (should only have seeds in the strainer). You will have about 1 1/2 cups of pureed blackberries. Stir in the sugar (add more sugar if needed). Refrigerate for several hours. (There will be 1/2 cup of extra puree left over after making the fruit fools. This can be frozen for another use.) Then place mixing bowl and whisk attachment in the freezer for about 15 minutes. Whip the cream and sugar until stiff peaks form. With a rubber spatula gently fold in the blackberry puree, leaving some streaks of the cream. Pour into glasses. Cover and refrigerate until serving time (up to 4 hours). Raspberry Fruit Fool: For the Raspberry Puree: Thaw the raspberries in a large fine meshed strainer placed over a large bowl. Once the berries have completely thawed, force the juice from the berries by gently pressing the berries with the back of a large spoon. To the strained juice, stir in a little lemon juice and the white sugar (add more if needed). Refrigerate for several hours. Then place mixing bowl and whisk attachment in the freezer for about 15 minutes. Whip the cream and sugar until stiff peaks form. 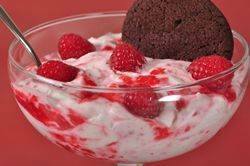 With a rubber spatula gently fold in the raspberry puree, leaving some streaks of cream. Pour the fool into glasses. Cover and refrigerate until serving time (up to 4 hours. Makes about 3-4 servings. Each English Fruit Fool recipe makes 3-4 servings. Preparation time 30 minutes.